Knorkator is a German band from Berlin-K?penick that combined Industrial Metal with non-serious and comical elements. They proclaimed themselves to be "Germany's most band in the world" (German: "Deutschlands meiste Band der Welt"), as the title "The best band in the world" was already taken by Die &Auml;rzte. The band was founded in 1994, but only played live gigs in the Berlin / Brandenburg area until 1998. Knorkator gained further fame (and some notoriety) in 2000 with their performance of Ick wer zun Schwein (sic; literally - berlin dialect "I'm turning into a pig") in the German national qualification for the Eurovision song contest. 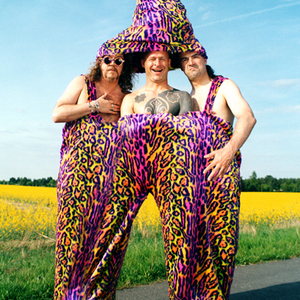 Knorkator's wild stage shows and explicit lyrics, as well as the fact that nearly half of the vocalist's body is tattooed black, have earned them a reputation as a chaotic comedy band; however, the band's music actually shows considerable technical and artistic merit that is sometimes overlooked. Most of Knorkator's lyrics are in German; however, some songs also feature English (Beating around the bush, Ma Baker etc. ), Thai (Mai khao djai, Khid tyng baan), Latin (Aeger sum, Absolution) or French (Ma belle f?mme, Franz Hose) lyrics.